Salmonella sent to space have revealed secrets aboutthe disease-causing bacteria that could help treat humans with food poisoning. Scientists sent Salmonellabacteria to the International Space Station aboard two space shuttlemissions in September 2006 and March 2008. The researchers found that when thebacteria were cultured in the microgravity environment of orbit, they becamemore virulent than those on Earth. The findings showed that the conditionsin which the bacteria grows affect how dangerous it will become. "This research opens up new areas for investigationsthat may improve food treatment, develop new therapies and vaccines to combatfood poisoning in humans here on Earth, and protect astronauts on orbitfrom infectious disease," said Julie Robinson, program scientist for theInternational Space Station at NASA's Johnson Space Center in Houston. Salmonella is a leading cause of food poisoning andrelated illnesses. About 40,000 Salmonella infections occur in the UnitedStates each year, according to the Centers for Disease Control and Prevention. It turns out that the zero-G environment of space actuallybears a resemblance to the conditions inside our intestines, as both have asimilar level of a mechanical force called fluid shear, which is related to themotion of fluids passing over cells. Since both space and human intestines havelower fluid shear conditions than most experimental conditions in labs onEarth, studying the bacteriaon the space station could give researchers a better idea of how it behavesin the human body. "To our knowledge, no one had previously looked at amechanical force like fluid shear on the disease-causing properties of amicroorganism during the infection process," said Cheryl Nickerson of theBiodesign Institute at Arizona State University in Tempe, a principalinvestigator of the experiments sent up to the space station. "We can usethe innovative research platform of the space station to contribute to newtranslational advances for the development of new strategies to globallyadvance human health." Nickerson found that tweaking the amount of ions in the bacteria'senvironment can stop the increase in virulence seen in space. The researchershope this technique could also lead to treatments for Salmonellainfections in humans, both on the ground and in orbit. Learning how to combat dangerous microbialinfections in space is especially important as NASA looks toward sendingpeople on longer-duration missions to the moon and Mars. 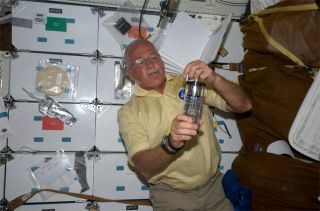 Astronauts on thesefuture missions will have to fight illnesses far from ground-based medicalhelp. Additionally, studies suggest that the human immune system is weakened bythe microgravity environment, so astronauts may tend to get sick more often,and have a more difficult time fending off infections. Life's Little Mysteries - Does Washing Fruits and Vegetables Make Them Safe?